Best earphones under 500 - Top 10 In India - Only The Best of everything! LATEST product list, updates regularly! If someone places ten different earphones in front of you and you look at them, you will never be able to gauge their quality. The jazziest and sleekest looking one may have the worst sound and the most boring looking one could have the best sound with resounding bass and real depth in the music and vocals. That means when it comes to earphones, looks actually is amongst the lowest priorities. The top priority is the quality of the music, and the second thing to really consider is the fit and comfort of the earphones. That really matters too. I mean imagine you are trying to put in the ear buds of the earphones and they keep falling out, or they make you ears feel like they are blocked. Not good at all. So, in reality the best way to gauge the quality, comfort and performance of earphones is by using them for some time. There is no better way to figure out what is best for you than actually experiencing the earphones for yourself. The next best way is of course to read the opinion of someone who has used and tested many earphones and is a bit of an authority on them. That is why we have asked Ranjeev Mohit, an ex GM of a major global sound equipment brand to give us his views on the best earphones under 500 in India. He is currently running his own speaker systems company and has been in this business for over 23 years. So, here is Ranjeev, giving his views on India’s best earphones under 500. These are one of the newest models that have come out from the boat brand, and they are a level up from their other 500 bracket earphones, BassHeads 225 and BassHeads 100. After using these headphones for almost a month, I can tell you that they are right now the best earphones under 500 in India. They have all the advantages of the 225 and 100 and none of their disadvantages. They fit very well in your ear and do not slip off, even when you are running or participating in strenuous sports or workouts. One problem of the BassHeads 225 is that for some people, they slip off from the ears when doing strenuous physical activity. However, in the boat BassHeads 152, this problem has been effectively solved. By the way the BassHeads 225 is priced at around 540, yet these headphones are better as per my assessment. Next comes the sound quality of the boAT BassHeads 152. Frankly I was very impressed with the quality of sound that I experienced. These are budget headphones and they cannot compare to the top end headphones, but in this range, the sound is great. The bass as per the product description is Extraaaa, and though it is not out of the world, it delivers. The sound is enhanced with 10 mm drivers and there is a total harmonic distortion of only 0.3 percent. That is why the sound is great, even though they are under 500 earphones. 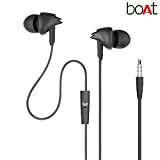 These boAT BassHeads 152 earphones also feature a passive noise cancellation feature that lets you enjoy music even in noisy surroundings. That means you can also take your calls in the middle of a metro ride or any crowded place. Also adding to the sound quality, though to a very small degree, are the superior coated cables and gold plated 3.5 mm jack. Another great feature of the BassHeads 152 is their braided wire which is non-tangle. If you use headphones often then you know that tangled wires is a perennial problem. Untangling badly tangled wires can become very irritating. With the BassHeads 152, thanks to the high quality braided wire design, the tangling problem is almost eliminated. These braided wires are robust and stylish, and don’t break either. Now let us have a look at the overall build quality of the headphones. The first thing I noticed is the high quality finish of the earphones. They do not in any way look like a cheap glossy plastic but have a classy finish, that coupled with the braided wires gives a really nice look. Although it doesn’t make a real difference to your overall experience, the looks of the boat BassHeads 152 are also pretty good. A neat additional construct feature is the angled jack, which makes it much easier to plug it in. With the earphones scoring high on all important aspects, I had no choice but to rate them the absolute best earphones under 500 right now. This despite the fact that they are relatively new. 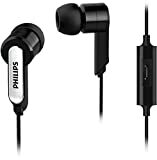 My number 2 pick for the best earphones under 500 will be the trusted and durable Philips SHE1405. These are not fancy looking and don’t promise a incredible bass, but they deliver good quality and good fidelity sound at a very reasonable price. These earphones are under 400 rupees and pack a punch in every aspect of the product category. These earphones have 8.6 mm drivers with sensitivity of 103 dB. The sound is very robust, the bass is good but not thumping crazy. The overall sound quality is clear and well rounded. These earphones come with the classic Philips clean looks and good construct, materials and quality. The cables are regular wires but at 1.2 meters length are quite convenient for outdoor use too. The Philips SHE1405WT earphones come with three ear caps of small, medium and large sizes so that you get a perfect fit. These ear plugs fit snugly into your ear and block out outside noise to give you a disturbance free sound experience. The integrated speaker and calling enables you to seamlessly take a phone call and switch back to listening to music, which is a feature that frankly every earphone offers, except a few that do not have a microphone. The 3.5 mm jack is silver coated and is of a durable and good quality. The best part about these earphones is their incredibly low price. That is what places them in the second spot, as in all other aspects they are decent but at this low price it becomes a great choice. Let’s not fool ourselves into thinking that these are top notch headphones that will last years and deliver top notch hi-fidelity sound. 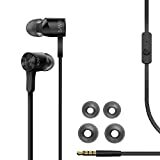 However, they will be reliable and solid and deliver good sound for a very long time, as long as you take some basic acre of the earphones. My number 3 choice for best earphones under 500 are the RealMe earphones. Though it comes from one of the top smartphone brands in India today, on their own these earphones are really good for their sub 500 price. I have used and tested them found them to be great in every aspect except for a slightly higher than normal volume when listening to music, but there has been some negative feedback about build quality. My feeling is that the criticism from some users were because of one well advertised quality of RealMe ear buds. The claim that they have 160% bass hasn’t gone down very well for those who were expecting a booming bass heavy sound. These earphones are enhanced with 11 mm drivers that jack up the volume and the bass. The problem is that in the process it pulls down the mid-tones. The highs and lows are deep and rich but the mid-tones get subdued. If this is a compromise you are ready to make, then these earphones have everything else you need in an under 500 model. I will add more to this review and also write about some of my special earphone choices below. So come back to this page soon. Everyone know Xiaomi the smartphone brand, but Xiaomi also makes really good earphones. They are made for their phones, but are also great on their own. I have thoroughly checked and tested the Mi earphones, and used them in all kinds of travel, home and outdoor situations. I find them to be the most durable and robust earphones around. The Mi basic earphones have a clean minimal design and their build quality and materials are pretty solid and reliable. The design is also quite neat, with a unique earphone shape and sleek looks overall. An important factor, ease of wearing and snug fit, is amply taken care of by the silicone earbuds of Mi which don’t slip off. At its price the sound quality is great, and I frankly have earmarked them as my first choice for back up earphones. They are solid and strong. The 3.5 mm jack is gold plated for better sound and clarity, they are very convenient to use and plug in. Though this is the basic version it has 10 mm drivers, which deliver a good rounded sound and decent bass. With the inline microphone, you can listen to music, take calls and shift between them easily and quickly. These earphones also have a wider frequency response range that translates into richer music and sound. As far a comfort goes, they are great for long listening, and you will not get tired with them plugged in and on, while you do other stuff. The earbuds are made from silicone and are quite high quality. My advise is that if you are looking for solid quality earphones that will let you listen for long hours without any problems, then go for the Mi Basic earphones. That was Ranjeev Mohit, writing about his choices for the best earphoens in India priced under 500 rupees. Now, for your convenience we are sharing a chart of the Top 5 Best Selling Earphones in India under 500 ranked from 1 to 5, according to all-India sales. India's most popular, and packed with value. Great bass, great value, universal popularity. Reliable quality, well balanced sound and features. Bass vents ensure deep rich bass, but does not have a microphone. Decent build, average sound, sweat-proof and has noise isolation.